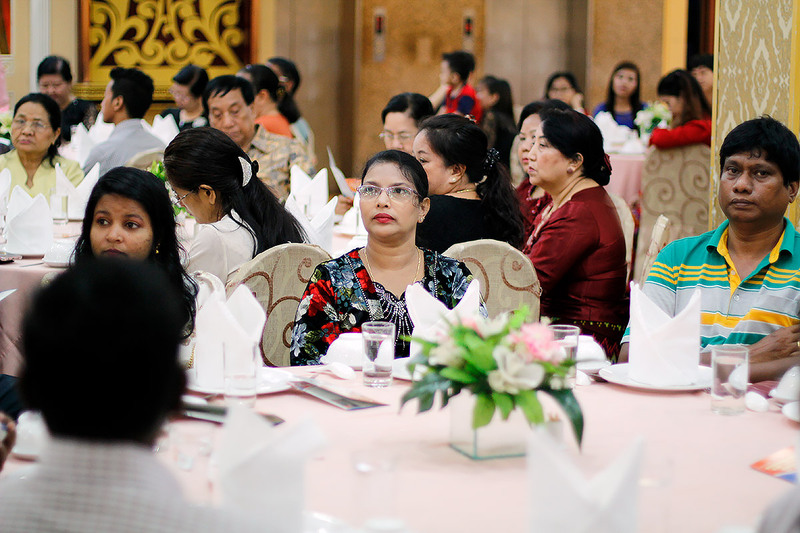 The commemoration of the 500th Reformation anniversary in Myanmar included a worship service, symposium and a common meal in Yangon. From the left: Rev. Peter Hoi Be, Myanmar Lutheran Church general secretary and Bishop Dr Andrew Mang Lone; LWF regional representative for Southeast Asia, Mr David Mueller and Ms Beth Mueller. Photo: LWF Myanmar/Isaac Htun. (LWI) – The Lutheran World Federation (LWF) member churches in Myanmar hosted a special worship service, symposium and common meal to commemorate the 500th anniversary of the Reformation in the country. 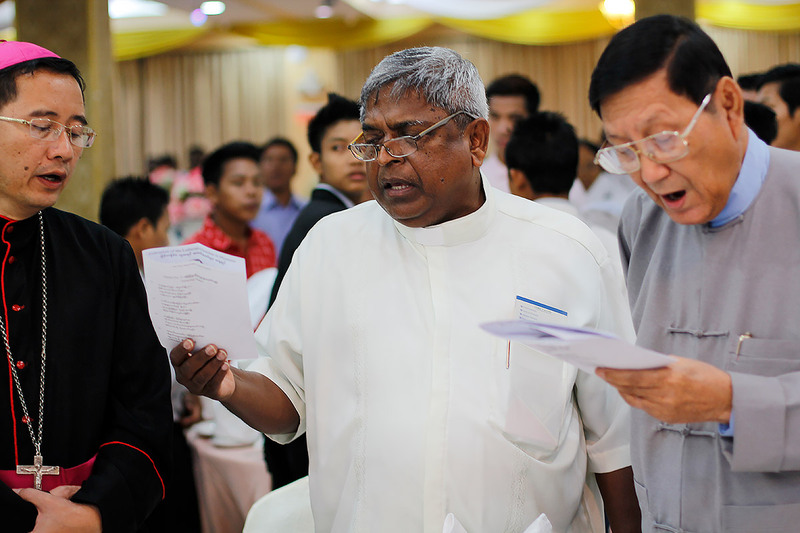 Leaders of the Federation of Lutheran Churches in Myanmar (FLCM) presided at the 21 October event, held in the largest city Yangon, during which prayers were offered for peace, reconciliation and freedom of all religions in the country. The more than 200 participants included staff from the LWF country program and leaders of Anglican, Baptist, Evangelical, Independent, Methodist, Presbyterian and Roman Catholic churches, the Myanmar Council of Churches and the regional Mekong Mission Forum (MMF). The FLCM member church leaders Rev. 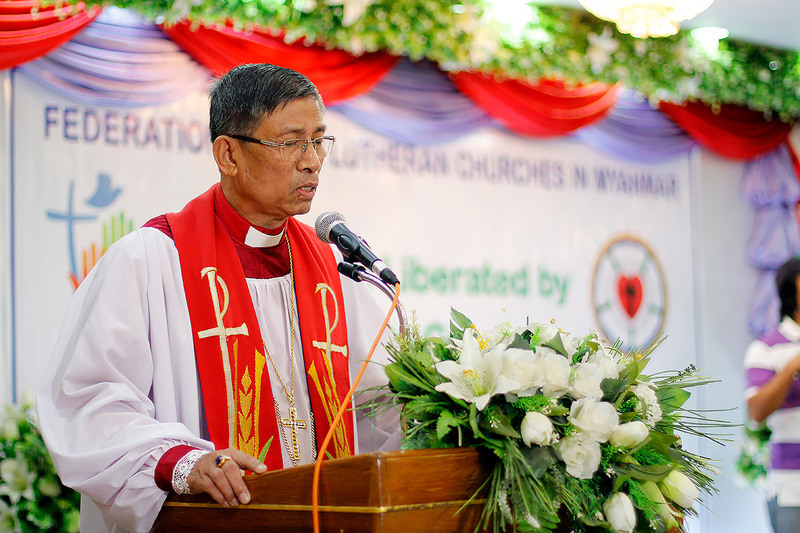 Martin Lal Thangliana, Lutheran Church of Myanmar; Rev. Satu Ve-U, Mara Evangelical Church; Rev. Dr Andrew Rajan Jenson, Evangelical Lutheran Church in Myanmar-Lutheran Bethlehem Church; and Bishop Dr Andrew Mang Lone, Myanmar Lutheran Church, presided together at the service. In his sermon, Rev. Dr Philip Baker, Asian region representative of the Evangelical Lutheran Church in America, which partners with the FLCM, said Luther’s contribution 500 years ago was to rediscover and reclaim the fact that Christ came to the world from God. Baker said Christians are sent out into the world today to be the hands, eyes and ears through which God works irrespective of the countries they live in. “God is not dead. God is alive! God lives in and through the people of God and sends us into God’s world to be people of reconciliation, healing and making all things new,” he emphasized. At the symposium, Rev. Dr Jan Depner Martin, interim pastor of the German-language Evangelical Lutheran Church in Hong Kong, presented a paper on the Reformation, and reminded the gathering that to be Lutheran is to be ecumenical. Presenting a brief history of the FLCM, the organization’s general secretary Rev. James San Aung thanked leaders of the four LWF member churches in the country for their active cooperation, which had made it possible for the Lutherans to host the two events in Myanmar—a worship service and symposium. “Our leaders have seen the importance of being united to promote God’s work and the ministry of the church in Myanmar through the FLCM,” he said of the churches, which have a combined membership of over 30,000 people, and collaborate with the LWF World Service country program. The FLCM was established in 2013 with a goal to foster closer relations between the Lutheran churches in their witness, diaconal action, theological study and training of ministers. It also facilitates communication with the LWF communion and the MMF, to which its members belong together with churches in Cambodia, Hong Kong, Laos, Malaysia, Singapore, Thailand and Vietnam. By FLCM general secretary, Rev. James San Aung & LWF Communications.